YOKOHAMA, Japan, Oct 12, 2018 - (JCN Newswire) - Mitsubishi Hitachi Power Systems, Ltd. (MHPS) announces that the steam turbine generation facilities supplied for the Sanmen nuclear power plant in China have cleared all necessary functional, safety confirmation, and performance tests, with a signing ceremony held on October 11. The turbine generators being used at the nuclear power station are MHPS' mainstay model with a 54-inch last stage blade. These systems have a proven track record at power generation facilities in Japan, and are now being used in full-fledged operations in China for the first time. The Sanmen Nuclear Power Station is the world's first commercial 3rd Generation 1,250 megawatt class pressurized water reactor (AP1000). The Sanmen nuclear power plant was built by Sanmen Nuclear Power Co., Ltd. in Sanmen, Zhejiang Province, south of Shanghai. The facility comprises two units, each with an output of 1,250 megawatts. MHPS provided six low-pressure turbines, two high-pressure turbines, the main valves and other equipment for the two units within the facility. 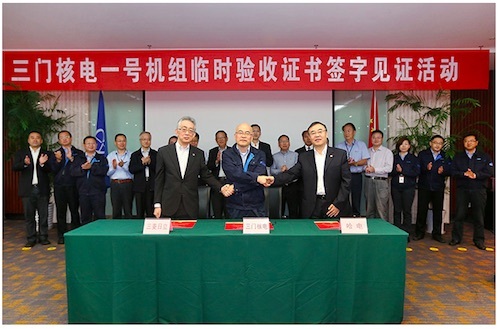 Harbin Electric Corporation handled the turbine casing, heat exchanger, auxiliary equipment and other equipment, while Mitsubishi Electric and Harbin Electric each supplied one of the two generators. The designs for the turbine, heat exchanger, and auxiliary equipment were all provided by MHPS through a technology transfer. The Sanmen Unit 1 began fuel loading at the end of April 2018, and reached 100% output in mid-August. After clearing performance tests and the 168 hours of continuous demonstrated operation additionally required by the Chinese government, the plant began commercial operation. The power generating unit, as noted previously, is the world's first commercial AP1000. MHPS assigned engineers on a long-term basis to conduct prior verification tests with the nuclear reactor and turbine sides, as well as confirmation tests on site. The meticulous project management and close communication led to a smooth start of commercial operations. Going forward, MHPS will continue to contribute to resolving the global issues of stable energy supplies, economic development, and reducing the environmental load by providing steam turbines for safe, reliable, and high-quality nuclear power generation facilities.